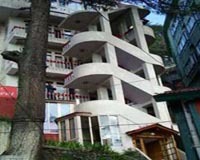 Hotel Sangeet is centrally located Luxurious Hotel, has Cable TV, running hot & cold water supply in bathrooms of Super Deluxe, Deluxe rooms & Suites. Other services included laundry, travel desk, and doctor on call. Each and every room is reflection of the hotel's elegant interior and exterior décor carried out by the highly professionals of the gracious hospitality industry. All the deluxe rooms, super deluxe rooms and Family suites offer spectacular picturesque view of Himalayan forests and hills. The emphasis is given on a discreet use of the latest in comfort to enhance the hotel’s classic facilities and charm of gracious hospitality. Airport 21 kms, Railway Station 2 kms, Downtown Area Situated in.